With speculation over the past few months that the next generation iPhone would come equipped with a nano-SIM card tray, some photos have finally surfaced. A translated report from Nowhereelse.fr has brought extended proof that these SIM-card trays are in production. Presented as being designed to slip into the SIM card slot of the iPhone 5, this element seems in turn confirm that the next iPhone indeed adopt this new standard imposed by Apple. I take this article to drag other photos with us in passing a Home button which should equip the iPhone 5 and which is also slightly smaller than previous generations, details of which we heard last Friday. In June the European Telecommunications Institute (ETSI) had reportedly chosen Apple’s nano-SIM design. 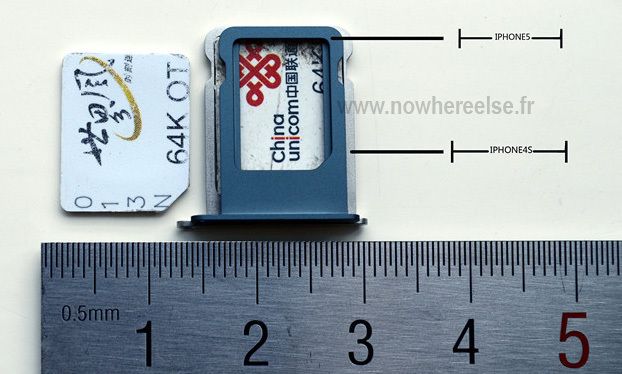 The new cards were noted 40 percent smaller than the micro-SIM used inside the iPhone 4S. The exact dimensions were determined to be 12.3mm wide by 8.8mm tall, and 0.67mm thick. Just a few weeks ago we received even further proof that the iPhone would adopt the nano-SIM. A BGR report surfaced claiming multiple carriers told them that Apple was supplying nano-SIMs to test on their network.